Provide comfort for the family of Annie Jenkins with a meaningful gesture of sympathy. Ann Ward Jenkins, daughter of Lester and Hattie Mae (Stanley) Ward born on February 22, 1931 in Tarboro, North Carolina departed this life on March 14, 2019. She graduated from Pattillo High School in Tarboro, N.C. She received nursing certificates from Children's Hospital-Boston where she was employed for over 40 years. She united in Holy Matrimony with Harold Linden “Jack” Jenkins, Jr. on November 15, 1954 in Bethel, N.C. Ann brought to this union one daughter and three more girls were born to them. The youngest was born in Boston. In the late 1950's, at the suggestion of Jack's sister, Bea, the family became part of the African-American migration to the north. Jack found work first and sent for his family. Ann was able to get a job the first day she applied at Children's Hospital-Boston. They asked if she could start that day! She told them she had to start the following day because she had to make arrangements for the care of her children. Her children were always her main priority. Ann was a good at crocheting, an avid reader and could read a 400-page book in 2 days. She was a great cook and was well-known for her perfectly seasoned golden fried chicken! Ann's biggest joy in life was her family and she loved having her grandchildren and great-grandchildren visit! A big moment in her life happened when she reunited with a younger sister whom she hadn't had contact with for 66 years! Their mother had passed away at a young age and the children went to live with different families. The Lord let them have 9 wonderful years together before calling Auntie Rose home in 2018. They were so similar: They both went into nursing, both named their daughters Sharon, had the same clothing and hair styles. Ann married a Jenkins and Rose’s father's surname was Jenkins! Ann was predeceased by her husband, Harold “Jack” Jenkins, Jr. and siblings Rosetta Anderson, Edna Bryant, Lester, Jr. and Charlie Ward and in-laws: Barbara Jean Taft, Raymond, Frederick and James Jenkins. The life and memory of our loved one shall long be remembered by her children: Barbara Ward-Moody (Eugene); Deborah Jenkins, Renae Jenkins, and Sharon Toni Jenkins, all of Boston, MA. Her grandchildren: Shakinah Sequea (Shaun) & Brian Terrell Jenkins & great-grandchildren: Leilana, Justin and Adrianna Sequea, all of Boston, MA, nephew, Kelvin Anderson, and niece, Sharon Davis and both of Virginia. She also leaves behind her sisters-in-law: Beatrice Willis, Boston; Ruth Burnett, California; Brenda Terrell; Joan Willis, both of New Jersey; brother-in-law: Jesse Jenkins (Jeanette), New Jersey and many relatives and friends including Mrs. Sheila Williams and family and Eva Webb & family. There will be a Viewing on Thursday March 21, 2019 from 10:00 to 11:00am followed by Funeral Service at 11:00 O’clock at Morning Star Baptist Church, 1257 Blue Hill Ave., Mattapan , MA 02126. Funeral arrangements entrusted to Riley-Antoine Funeral Home. To send flowers in memory of Annie M. Jenkins, please visit our Heartfelt Sympathies Store. 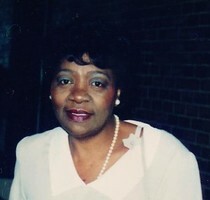 Provide comfort for the family of Annie M. Jenkins by sending flowers. Thank you Leonid & family for your kind words, prayers and thoughtfulness.